Her name was announced 6 March 2009. This was after a long public relations campaign by United States Representative Kay Granger, former Deputy Defense Secretary Gordon R. England, and others. The ship was built by Lockheed-Martin. Her keel was laid on 11 July 2009 during a ceremony at Marinette Marine Shipyard in Marinette, Wisconsin. Fort Worth includes additional stability improvements to deal with issues found on USS Freedom (LCS-1). Lockheed Martin announced on 15 June 2010 that the ship was at its halfway point in construction was on schedule to be delivered to the Navy in 2012. The 80% completed ship was launched by its contractor on 4 December 2010. The vessel underwent sea trials in Lake Michigan during late 2011, with the completion of these trials announced on 24 October 2011. The ship successfully completed its acceptance trials, which also took place on Lake Michigan, on 4 May 2012. The inspectors only found ten severe deficiencies during the trials, an "exponential" improvement over Freedom. The improvements to the ship include a lengthened hull, which makes her faster than Freedom and ten percent more fuel efficient. Fort Worth was commissioned in Galveston, Texas 22 September 2012. 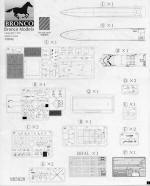 This is the second modern 1/350 ship I have seen from Bronco, and it is a good choice. 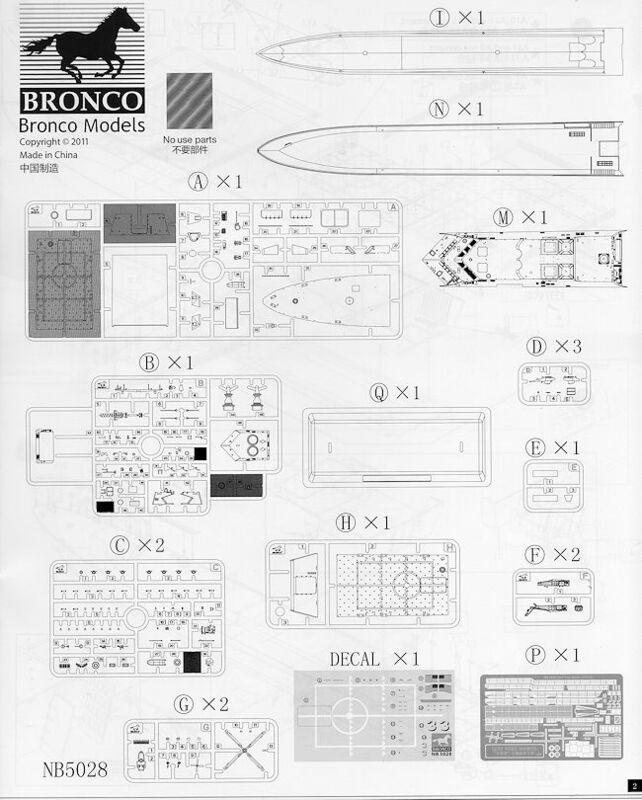 This kit is also completely tooled by Bronco in case you were wondering if it was a rebox. The kit comes with a very nicely done photo etch fret. I did noticed that the p.e. is rather thin and so because the kit is so loose in the box, the fret took a bit of a beating during transport. This is a quite complete fret and includes all of the ship's railings as well as the safety netting around the landing pad. This latter item can be molded raised or lowered. There are also helo blades included in this fret and a few other smaller bits, but most of it is railing and helo bits. The kit can also be built as either a full hull, in which case nicely modeled water thrusters and a display stand are used, or as a waterline kit. This latter will require the removal of small alignment pins on the underside. Both the large rear boat access doors and the smaller side doors can be molded open if one wishes and there is a small boat or two to place there. This is also true of the door to the hangar bay. For helos there is a pair of MH-60s as well as three MQ-8B drones. Helo blades can be built extended or folded and are photo etch. Though the ship looks pretty clean in the box art, there are actually a myriad of items that fit on the central structure. This includes various light guns and shields, smoke/flare dispensers, rocket tubes, antennas of a wide variety as well as a rather complex looking ship's main mast. In other words it is not a weekend build. Instructions are excellent shoeing what needs to be trimmed, what holes might need to be opened as well as what bits are photo etch. Thanks to using color, the p.e. bits are easy to spot in the instructions. Detail images are also provided for areas that might require some additional enhancement. 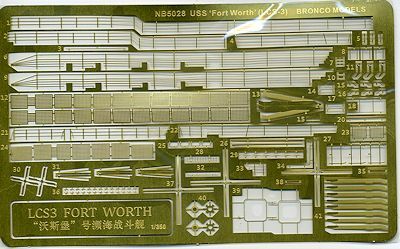 The decal sheet provides landing platform markings, ship's hull numbers, insignia for the helos and a few other items. This is really a nice and most complete ship kit. Thanks to having all the railings included, I can see little reason to do any aftermarket for it. It is well detailed and not so large at a bit over 13 inches, that it will overwhelm your display area. Thanks to www.dragonmodelsusa.com for the preview kit. Get yours at your local shop.